TRATTORIA "Porco Rosso":PROJECT 2 DONATE:WA WA PROJECT-Social Creative Platform for Opportunity-Know and support projects in eastern Japan ! Interview: Yamazaki Jun／TRATTORIA "Porco Rosso"
After the disaster, at a time when lifelines had been cut, Yamazaki Jun who runs an Italian restaurant in Ofunato City made rice balls using all the rice and fresh water he could gather. Many helpers gathered under Yamazaki's supervision, who continued to deliver food to evacuation centers, and reaching the capacity to deliver approximately 2000 meals every day. Their activities continued until all the evacuation centers opened after March 11th 2011 within the city were closed, with the objective of "making meals until the disaster victims are able to support themselves." In October 5th 2011, he reopened his own restaurant, with the aim of making links between the fishing, farming, catering, and manufacturing industries, in addition to developing a sustainable approach to the reconstruction of the town. Directly after the earthquake, the organization made 2000 meals every day, delivering to evacuation centers and temporary housing estates while also taking door-to-door orders from victims. The person responsible for initiating these activities is Jun Yamazaki, owner of an Italian restaurant in Ofunato City. On March 11th, a tidal wave surged towards Jun's restaurant, but fortunately it escaped flooding. Even still, electricity and water were cut off, and dishes and pots were scattered about the kitchen. In a state where even food couldn't be prepared, Jun rushed without hesitation to buy rice. With all the rice and water he was able to gather, and resorting to candlelight, he began to make rice balls. "When the Great Hanshin Awaji Earthquake occurred, I was in Rome not Japan. Feeling regret at the time, I decided if something else happens, I must go to help. As I am a chef, even before thinking I was moved to take action by delivering food." However, working by himself Yamazaki soon reached his limit at 60 rice balls. When attempting to deliver food to a large number of evacuees, it inevitably became necessary to find help. Under the supervision of Yamazaki, who was close to his wits end, high school students who dreamed of becoming chefs gathered to his aid, and this group continued to increase with a growing number of "repeater volunteers" who came to help on holidays or even moved to Ofunato from all over the country. These activities which had started with the making of 60 rice balls had gradually spread, going on to prepare approximately 2000 meals a day. And it was Yamazaki's determination to continue to make meals until all evacuation centers had closed, and disaster victims were able to support themselves. "Our town has suffered at the hands of the tsunami, and many lives have been lost. In the Great Hanshin Awaji Earthquake, over 200 people who entered temporary housing died alone, or took their own lives...... When so many have already lost their lives to the tsunami, if even one more person is lost in such a way it will be unbearable. Next it won't be a natural disaster, but a man-made disaster. If we can help others in some small way by doing what we can, then it is my intention to continue these activities." At the time of the interview (July 2011), lunch boxes were being placed in a line at Rias Hall (Ofunato City Culture Hall) which had become the base of Yamazaki's activities. It was not only the lunch boxes themselves but also their distribution by human hands which led to many waiting eagerly to enjoy communication with the volunteers. 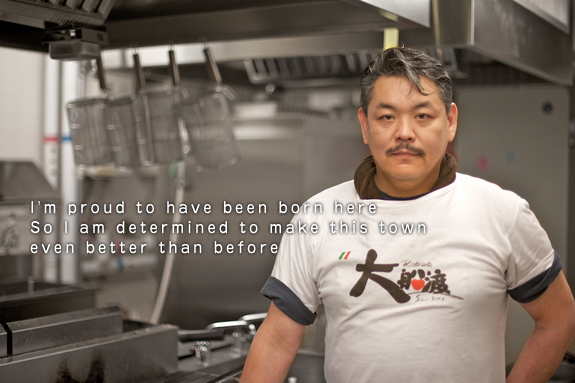 In delivering meals, Yamazaki was able to discover the pride he has in his birthplace. "Days after the earthquake, some of those who were given rice and curry in a paper cup showed their gratitude with tears. Having lost homes and families, and staying in school gymnasiums which serve as evacuation centers where heating is unavailable, people are just thankful for being able to eat. Even when not eating sufficiently themselves, they are willing to make sacrifices. In one school when I took meals to the residents, I was told 'we have already eaten, so you should deliver it the school over there'. When asked 'how many meals did you have today?' they replied, 'We ate a rice ball in the morning and at night'. This is nowhere near enough. My town is a place with beautiful sea and mountains, but more than this it is the hearts of its residents in which we may find beauty. There is much that I personally have lost, but there are also so many things I have received after the disaster, so I have come to think it isn't all negative." Yamazaki had been readying his shop to become a base from which to distribute information and convey the appeal of his town. This wish has grown all the more in strength since the disaster, with an aim now to make links between the fishing, farming, catering, and manufacturing industries in order to develop a sustainable approach to the reconstruction of the town. "It is no good simply returning things to how they were. We must make the town better than before including the farming industry, fishing industry, and manufacturing industry. As we are receiving this much attention from the world, I want us to stand properly on our own feet again and convey the splendor of Sanriku Kessen. The cost of the losses has been immense, but in the opposite way this gives us a chance. I hope we can continue to make developments 5, 10, 20, even 30 years from now. It will take time, but I'm sure we can build this place into a great town and I hope many will come to visit and enjoy it. We will be able to prepare much delicious cuisine from the Sanriku sea and mountains, so I welcome all to come and see our town." The activities of Yamazaki which started from March 11th in 2011 were, with the closure of all evacuation centers within Iwate Prefecture in August of the same year, brought to their conclusion. The food delivered over the 5-month period reached a total of approximately 17,000 meals. After seeing the closure of the evacuation centers, Yamazaki was finally able to begin the move towards the reopening of his own shop. "Even with the move to temporary housing, there are some who are unable to get about, and elderly members or others who cannot cook for themselves. I delivered meals to these kinds of people, but the disaster has highlighted a number of issues and problems within society. In the first 1~ 3 months there was 'an urgency for food' so there was a part that we could play, but 3 months on, the urgency has gone and it has become an issue for local authorities. I talked with the city mayor, and I was told 'It is not a healthy society if voluntary organizations have to take this burden'. At first, I did what I could as a chef, but then I reflected that there are other things I have to do, and so I decided to restart my shop. After establishing a new restaurant, flower wreaths were displayed at the entrance and customers gathered. When I saw this, I thought this was also something important for the town." In this way, on October 5th, 2011 the Italian restaurant "Porco Rosso" was reopened. On the opening day, congratulatory garlands of flowers almost too many in number to fit in the entrance were delivered, showing just how many people wished to brighten Yamazaki's shop. "There are those who lost their shops and restarted them as temporary stores, and there are those who started to work at catering establishments. Everyone is doing what they can. There is nothing special in this. Italian food restaurants cook pizza, and make pasta. It's obvious, but returning to what we have done up until now is something that will really encourage the people of the town. When I was distributing boiled rice, it was a real power to hear 'they restarted their shop, you know'. When people work hard and decide sometimes to go out and eat good food, I want my restaurant to be the place where they can feel refreshed. This is the true function which the shop should take, and it must be a good thing if I can make people feel just a little bit better." Yamazaki talks of the need for producers, the manufacturing industry, and the catering trade to unify together to convey the cuisine of Sanriku beyond the prefecture, and the need for a place where the experiences of the disaster can be shared. "A little while back, I went to visit my parents' grave. In the shrine grounds, there was a memorial stone to mark the tsunami of 1934. From an early age, I have paid numerous visits to that shrine, but I had never read it. Upon reading it, there set in the stone were the words "an earthquake will come every 40 years. When the tsunami attacks, run to higher ground!". But we had not paid attention to what our ancestors had left behind for us. Through asking around at each evacuation shelter, and gathering much information we came to consider what action we should take and where. I think we have to create a platform from which the experiences of the disaster, and the lessons and know-how gained can be shared with the people of Japan and the wider world." Of course we do not wish to witness an earthquake and tsunami for a second time. However, in the same way that our predecessors have conveyed to us, the fact that natural disasters are sure to occur again, and the seriousness of the damage which was brought by this earthquake, cannot be forgotten. "Directly after the earthquake, there was a feeling close to anger at nature and the sea which had left our town in such a terrible state, leaving the thought 'what are you going to do for us next?!" But just how much have the fruits of nature given us?' We forgot that tsunamis can attack, and that nature can become wild. I think it is in working well with nature that we can restore the different types of fish of Sanriku, the vegetables, and other delicious food. It is also a big mistake to think that a seawall will prevent tsunamis. In 5, 10, even 100 years, I want to pass on the beautiful oceans in the same beautiful state to future generations. I think this is what makes an appealing town even in rural areas."